Elements Applied: The herb is applied in period of its blossoming. Used For: The herb is applied for killing bowel helminthes, fighting diarrea, constipation, boosting expectoration and urination. It is said to possess healing properties. Betony is widely prescribed by homeopathists as a remedy for heartburn, bronchitis, and asthma. Taken in form of infusion the medicine is effective in abnormally high perspiration, spitting blood, kidney and bladder diseases, and neurasthenia. To kill intestine helminthes a strong decoction is applied. Herb juice is applied for curing sores, skin ulcers, and cuts. To treat sprains, a poultice produced from the leaves was applied directly to the affected area. 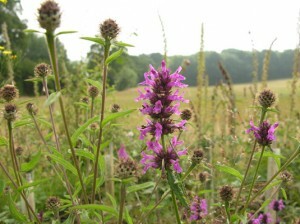 Additional Info: Betony belongs to perennials, and is native to forest paths, on the slopes, damply and dried meadows, and in the gardens of Europe. The stem commonly reaches 20 inches high on average, and is devoid of leaves, or has only some of them. The leaves are covered with fuzz, with the upper ones being lanceolate, and the lower ones having an oblong shape. The plant blossoms in summer, when red or purplish flowers appear. Preparation and Intake: To make an infusion, pour a cup of water onto 1-2 teaspoons of herb extract. Use 1-2 cups a day, one deep swallow a dose. To make a decoction, pour half a cup of water onto 2 teaspoons, and make it sweet according to your taste. Used in a dose of half a cup a day; one deep swallow a dose.